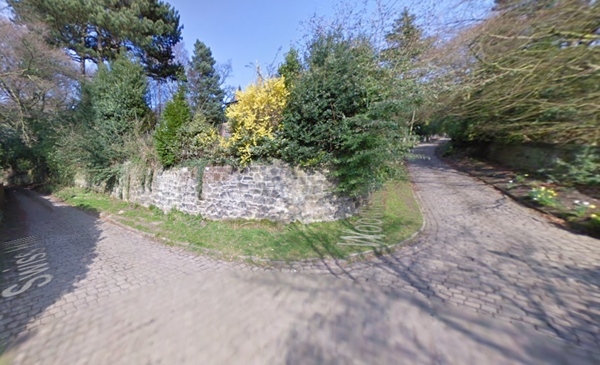 In the spirit of research, I cycled up Swiss Hill today to get an idea of what it must be like to tackle the cobbled Flemish bergs seen in the Tour of Flanders and many of the other Belgian classics. It absolutely wasn’t that I couldn’t follow the route I’d been planning on doing, found myself next to it and went up it on a whim because I knew it was infamous. The exact length and average gradient rather depend on what you consider to be the start and end. It’s roughly 700m at 10% which is in the same ballpark as the legendary Koppenberg, which is 600m at 11.6%; and it perhaps trumps the Paterberg, which is 360m at 12.9%. Living on the fringes of the Peak District, steep slopes are not unknown to me, but I wanted to know what impact the cobbles would have. There’s a cobbled stage in the Tour de France this year for one thing, but it’s also worth having an idea what the riders are going through at the Tour of Flanders and Paris-Roubaix because these races are renowned for being the toughest there are. The novelty lasted just a few seconds. As the road steepened, I realised that riding uphill over cobbles is an almost transcendentally unpleasant thing to do. It’s not that I thought it would be easy. I’d anticipated it being hard and annoying. Have you ever ridden into a bit of a pothole on an otherwise smooth road and lost a big chunk of speed? I’d kind of assumed it would be like that, but near constantly. But it isn’t really. That kind of experience is irritating because you lose momentum and sacrifice recent effort. Here, you never actually have any momentum, so the clunks are somehow less frustrating. Every pedal stroke transports you the exact distance that your wheel has revolved and no further. That’s the deal. No, the overwhelming sensation is actually just one of profound physical discomfort. It’s all the leg-burning, wheezing effort of a normal steep hill with your heart tapping out that worrying syncopated rhythm. Then, on top of that, there’s a whole extra dimension of misery as you’re bounced around, vibration coursing through your handlebars like you’re clinging onto a cartoon pneumatic drill that’s got some place better to be. Suffice to say, I was mightily relieved to reach the top – although the elation somewhat dissipated when I took a sharp left and realised that this wasn’t actually the top at all. Don’t be fooled by the beautiful spring scenes in these images, by the way. It wasn’t like that. There was a thick slick of old damp leaves in the gutter. You quickly learn to lower your standards considerably with regards to what you consider to be a reasonable road surface. If most of the cobbles are there and they’re vaguely flat and they’re not covered in moss, mud or leaves, then you aim for them. One of the big challenges is that you pretty much can’t stand on the pedals, even where it rises to 16%. If you do, your back wheel loses traction. You need to sit and sustain steady power without any sudden surges. By the time I reached the actual top, my bike had picked up at least a couple of new weird noises. I hope it’s okay. I haven’t checked it properly because when I got home I needed to go indoors and eat a number of sandwiches. Are cobbled classics riders hard? Hell yes. 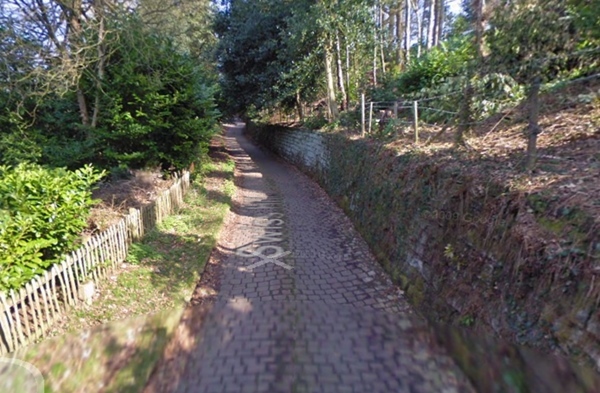 This was one cobbled climb. Those guys do any number of them over the course of a race and they don’t get to pick a day when it’s not lashing down with rain and blowing a gale either. Chapeau to them all. Even the crap ones. Many thanks for taking the time to conduct an experiment on the difficulties in riding up a cobbled hill. I am only used to cycling on tarmac and the odd muddy track, so it’s interesting to get a perspective of a different road condition, especially given the crucial part they play in the Belgium Spring Classics. In fact your article has inspired me come the good weather to have a shot on a cobbled climb! However with discretion being the better part of valour I think I would want to try it on dry conditions before having a go in the wet! Yeah, I wouldn’t ever advise climbing one in the wet. That would add certain frustration and a touch more danger to an already heady mix of unhappiness. Nice article. You really capture the sensations well! I always thought that the UK could/should have developed some prestigious one-day classics races just like the ones on the continent. Maybe there will be, although with the growing popularity of the Tour of Britain and a three-day stage race in Yorkshire from next year, perhaps classics-style stage racing is the nation’s niche. This is really useful. 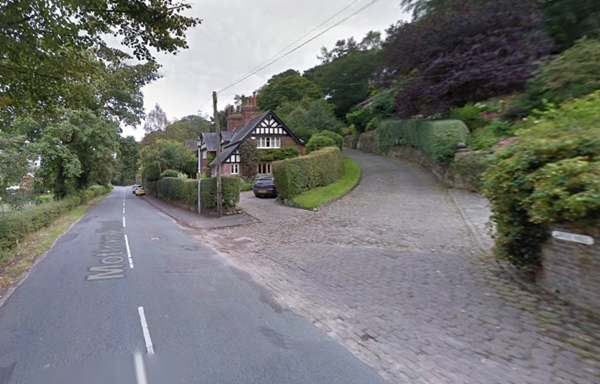 Decided that I’m going to venture over to Alderley Edge this weekend and decided to include this climb in my route. There no rain forecasted so should be quite dry and easier to ride on, luckily. I am a masochist who seeks out the norths cobbled climbs that are realistic on a road bike. I’ve also done quite a few of the Belgian classics. I tell you now that the likes of Swiss Hill, Shibden Wall, Thwaites Brow, Gibb Lane and Hainworth lane are significantly harder than their Flandrian counterparts. Yes, these cobbled horrors are horrors but are fantastic and unique challenges. That middle steep broken bit on Swiss Hill is hard and using Tarmac on right would not be ‘in the spirit’! Apology accepted. Thanks for the tip. I decided to go up Swiss Hill for a laugh today and that was a terrible idea. I stuck to the right as it was marginally acceptable to ride on compared to the left. If I stuck on the left, i would have been asking for 2 blow outs and a new set of rims. Before taking a right towards the end, i decided to keep on peddling up the cobbles into someones drive way. My heart rate averaged 185 all the way up. It starts as a ‘terrible idea’ and by the end it’s ‘great fun’ – you’ve summed up the mentality of the cyclist well there, Darren.